We live in an area of Seattle that is not known for its urban homesteading. It's known for its manicured lawns, manicured shrubbery (think Edward Scissorhands), lack of trees and covenants. Out of a community of roughly 360 homes, there are only a handful of us doing any kind of reasonable food gardening. There are a few homes that have solar panels, but we are routinely warned that if we want to get them, they have to be approved by the board. In other words, we don't have a whole lot of control over what we do on our own property. We knew this going in, but that was before I became the Crunchy Chicken. Getting our chickens approved was a year long project and I had quite the disagreement with the previous board president. He was extremely rude to me about it and, even though he was overruled by Seattle City laws, he made it clear that he wouldn't want to be my immediate neighbor. Now, several years later, most of our neighbors don't even know we have chickens. And those that do help out when we are out of town. Well, a few months ago our next door neighbors moved out and new neighbors moved in. I wasn't sure if our chickens were going to be a problem, but it was quite the contrary. About a month ago one of our new neighbors stopped me to say that he'd love to talk to us about our chickens because they were planning on getting some themselves. They were also planning on ripping out all the rose bushes in their backyard and putting in tons of raised beds, a greenhouse and planting fruit trees. They were newbies at all of it and I let him know what we were up to over on this side of the fence. I chatted with him for a while and I think he realized he'd moved in next door to the urban homesteading jackpot. I later dropped off a veritable library of books, some to keep and others to borrow. I haven't had a chance to check in with them yet, but I can't tell you how excited I am to have neighbors just over the fence pursuing the same urban homesteading dreams that I have. It's been so lonely around here, but now I don't feel so much like an outcast. Now I feel like a valuable expert. That's one reason I live where I do... no HOA. It's so great you have like minded neighbors living next door to you! That is the best. I absolutely wish our neighbors were interested in chickens and gardening and bees and such. I would love it! With that said, though I also love that my neighbors are just willing to deal with garden which sometimes gets a bit out of control and no one has ever complained. We've had a very similar experience. We don't live in an HOA and it's not what I'd call a "nice neighborhood" but raising livestock and growing food is definitely not the norm. We had some awesome neighbors that decided to walk away from their house. We were really nervous about what our new neighbors would be like. Turned out they were awesome. They now have chickens (including two roosters) and have planted dozens of fruit trees. Our neighbors across the street also have chickens now, with a rooster of their own. Same with the guy a few doors down. It's definitely getting to be more popular. Wow scary, but glad to hear that it worked out for you. That's why I'll never live somewhere with an HOA or restrictive covenants. Arbitrary rules about what I can do with my house/land? No thanks. We just got new neighbors in a rental behind part of our yard. The husband's first words to me over the fence was "We love your chickens! We're trying to talk the landlord into letting us have some." He's been picking up his grandson and holding up so he can see the chickens. Then he went on about his worm compost and the berries he was planting, etc. I think *I* may have hit the jackpot! So glad this worked out so well and that you are feeling valued for your commitments, interests, and talents. What a great way to start the new year. I realized reading your post that you describe why I've been volunteering for two amazing farmers at the farmers' market for the past decade—I enjoy being a resource for vegetable questions, hearing from shoppers about their kitchen experiments (and sharing mine), and finding common ground (pun intended) with the growing number of new and returning customers. Thanks for giving me that perspective. Well, the rules aren't totally arbitrary, they are just 60 years old. Fortunately, the board can be flexible and it does prevent the neighbors from building/parking all sorts of weird stuff. So, there are definitely benefits as well. Wow, I'd love to be your neighbour! 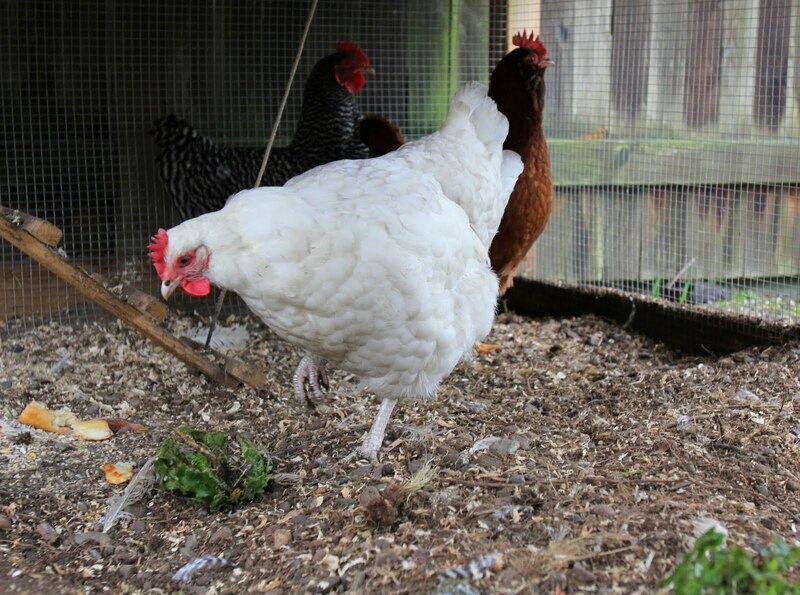 Luckily we don't have an HOA here so we can largely do what we like within the city by-laws, but my city (suburb of Vancouver BC) has by-laws that do not permit chickens in suburban backyards (must have 1/2 acre or more). Some local activists have tried to change that but it still stands. I love where I live and I love my ever-growing suburban homestead (raspberries, blueberries, 4 raised garden beds), but chickens would really make me happy. I wish I had known when we moved from a town home that I would be into doing urban homesteading because perhaps we would have moved to another area.